Enemies of the free world have found that "Death Waits In The Dark" when the Special Operations soldiers come knocking. 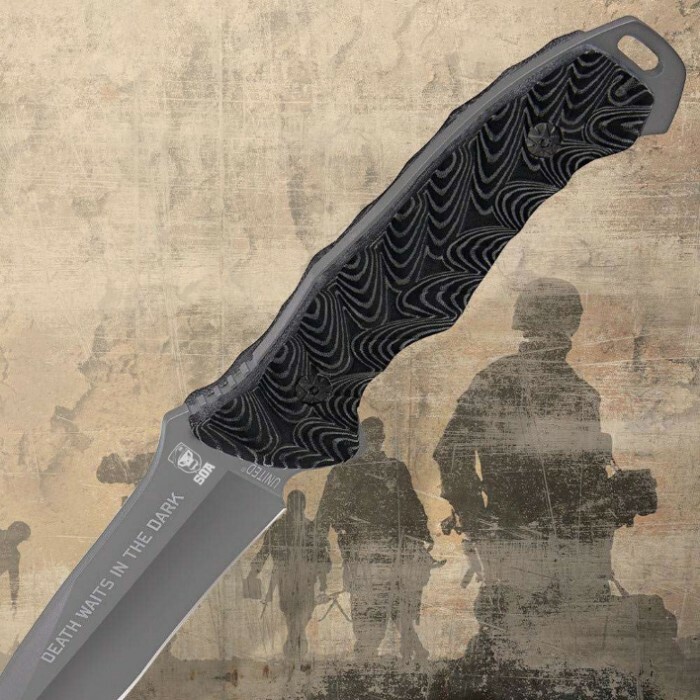 This SpecOps combat knife features a contoured premium Micarta handle which not only gives this knife a tactical appearance, but is also slip resistant and extremely easy to grip even while wet. The 4 3/4 in. full-tang blade has been finished to reduce glare and prevent corrosion, then etched with "Death Waits In The Dark" and the S.O.A. emblem. The extended tang of the blade can be used as a bludgeon or pry bar in emergency situations. Each knife includes a custom, molded Kydex sheath with a high-pressure metal clip that has been laser-etched with the S.O.A. emblem and also offers pre-drilled lanyard holes. Because the sheath is custom-molded it prevents the knife from falling from the sheath, even while clipped upside down on a shoulder strap or rifle sling. 9 3/4 in. overall. I've paid well over $50 for fixed blades of this size & quality. For $20 I didn't expect such a solid blade. An unbelievably low price! Good balance, good grip & lethal appearance(because it is). I recommend this, it's really a must have for anyone. BUDK & United Cutlery continue to impress! This knife was a christmas present i had picked out. I wasn't expecting much as it was only twenty dollars and even came with a kydex sheath. However i was extremely impressed with the durability of the blade, the feel of the grip, the impressively built sheath, and honestly the grip just looks incredible. The blade feels powerful and simply wont bend or be dinged or scratched. Very impressive knife United Cutlery. Thank you BudK you did it again this knife is awesome! The grip looks and feels cool, shape, thickness, and length of the knife is perfect. I was also surprised about the price, for a knife like this you'd have to pay $40.00 to $50.00, but the price was so good I ordered 2 now my Dad and I have more matching knives...that sounded weird, what ever thanks again BudK!!!!!!!!!!!!! When this knife came in it was far more than I expected. Very strong, full tang knife. The grip is very comfortable. The grip pannels will come loose if you hit the knife extremely hard or throw it like I did, but they barely come loose. Sheath is a sturdy fit, this knife never falls out on me. I would recommend this knife to everybody. 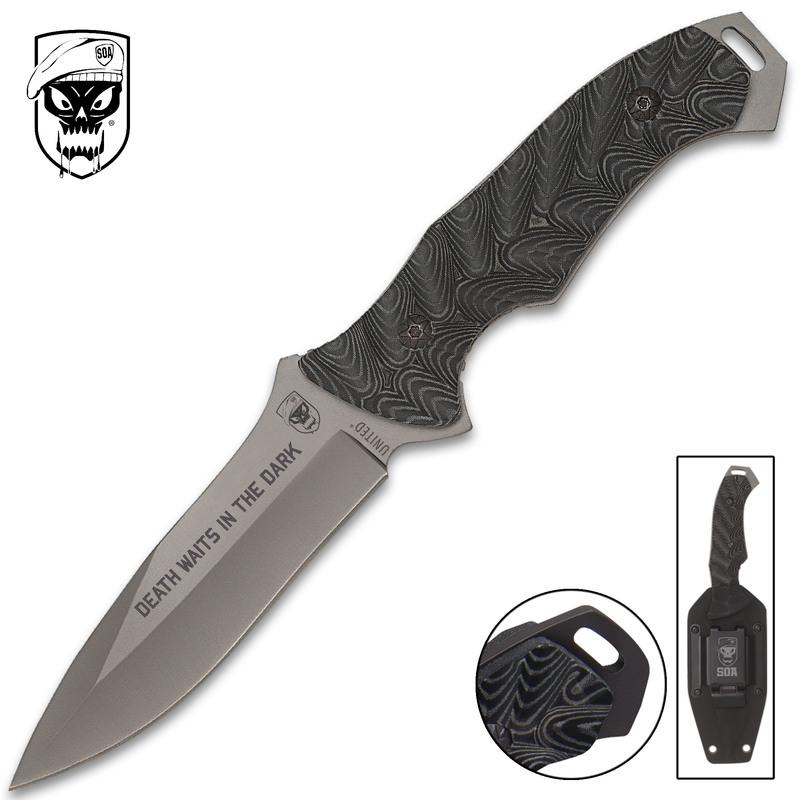 United Cutlery SOA General Purpose: Self Defense/EDC/Heavy Cutting Ratings out of 10 Sheath: 10/10 Blade:9/10 Handle: 8/10 Edge: 8/10 Durability: 10/10 United Cutlery has a record of giving you a decent blade for the price. The SOA is no exception. Overall size, this knife is great for a fighter/combat blade. It fits well in the hand in a standard or icepick grip, a little awkward if you prefer a saber grip. The micarta scares are tight and reasonably comfortable, secured with threaded star screws. The edge comes out of the box sharp. Not "shaving sharp", but pretty close. A few minutes with a whetstone solves that. The blade IS stainless, so don't count on it to hold the worlds most exceptional edge for an extended period, but for a stainless blade, it's really nice. The titanium electroplate gives a nice finish to the blade and should provide excellent corrosion resistance. The textured thumb and forefinger sections give nice control and a sure, standard grip. There IS a small recess behind the blade edge, but don't count on using it for close up work. You'll just end up with a cut in an uncomfortable place. The kydex sheath is the real stand-out of this knife. The sheath is sturdy, thin, and light. The molding secures the knife solidly, with a minimum of rattle and no real play to speak of, yet does not interfere with a quick draw. The clip on the back is sturdy, and well made, and the bottom of the sheath has two holes for attaching lashings should you choose to wear it on the hip. The configuration of the sheath and the mounting of the clip lends itself best to a small-of-back carry with a 45 degree cant. The knife is a bit short if you're looking for a survival/outdoor type blade,and is probably not the best for batoning, not because of the blade's strength, but based on length and shape. This is an example of a nice, single edged, fixed blade fighter. It has a blade short enough to be fast, but long enough for vital strikes. There is an unobtrusive lanyard hole at the base should you choose to use it, and enough metal exposed for a backhanded attack. The true, full tang construction should hold up well for both thrusts and cuts against soft targets, and the blade holds enough of an edge for utility cutting (rope, sticks, plastic, ect). Makes for a good, all around EDC knife if you prefer a fixed blade for every day carry. While not what one might consider a "high end knife", you'll go a long way to find something comparable at this price line. This is a knife I would confidently carry for protection and every day tasks. Great knife for the 20 dollar price point. Regards, "13"
I've had my knife about four years now and it's made from 7cr17MoV steel. It'll take what ever I dish out. it's an exact copy of the ALFA BENELLI. Even the sheaths are interchangeable with perfect fit. That aside it's an outstanding knife. I'll keep watch on reviews. If it performs as well as the 7CR17 steel I'll buy another. I got one for me and one for my girlfriend. The handle scales on mine were loose. They were tightened easily with the correct bit. The knife does rattle a bit inside the sheath. Would have preferred for it to be American-made. But, things being what they are, I suppose it's a decent buy for the money. Sharp and good feel. If you, your family and/or dog are menaced by vicious Pit Bulls, this is the knife for you. You will slice and dice the attacking dog like paper, and your trouble will be over. It worked for me, and the Police thanked me. It is an ok knife for the money. The weight is good and so is the balance seems to hold an edge. The handle is small and if you have a big hand it will not work for you. I like the profile of the case however it is not very secure and my first tactical job it fell out 3 time.